Not located in the convenient position of city center, but District 2 in Sai Gon of Vietnam always enchants visitors by amazing and cheap foods. 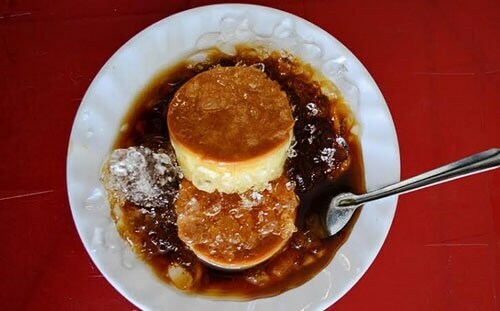 Flan cream, also known as caramel, is originated from the West and a favorite food of large people. It is not be hard to find a place to enjoy this dish. If you have a combined trip to discover the outskirts of Saigon in District 2, don’t forget to miss this nutritious dish with sweet aroma. The ingredients to make this delicious are quite simple such as eggs and milk, but the processing is not easy. In contrast, it is quite sophisticated and requires skilled cooks to make the pie not too soft, has certain stickiness. People also use different types of flavor, such as coconut milk, jelly, ice cream, and fruit attached to change the taste of the dish. And the most favorite flavor is coffee because of its cool, bitter taste. The price is about 5.000VND (0.23 USD) for a pie of flan. Beef-ball soup is a new dish and less popular in the city. For the date with friends, Beef-ball soup will be an “excellent way” when all of you are fed up with familiar dishes. 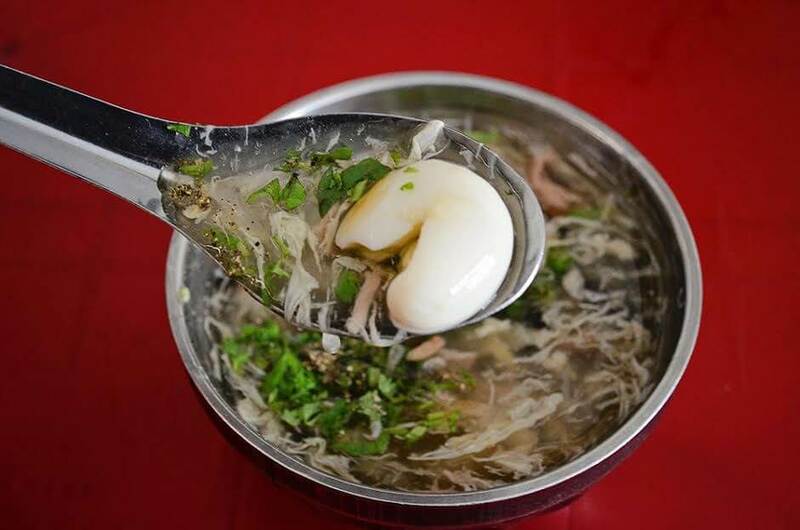 The dish is made up by simple ingredients including beef-ball, radish pieces blended with sweet broth, but it is so cool, attractive by exotic taste. The processors have to stew pork bone for about 3 hours or even more along with white radish, red radish to make sweet taste for the broth. The soup will become sweeter and clearer thanks to radish. And to retain the toughness of beef without being friable, people will pour beef in the final step along with a little chopped green onion and blended pepper on side when serving to the guests. Especially the dish will be better if you use it with a little of chili sauce. Besides, you can make more flavors if you add more lemon squeezed into the sauce. There is only a stall selling this dish in Luong Dinh Cua Street (District 2). However, if you don’t want to go far from the center, you can find beef soup at Ben Thanh market. Although Luong Dinh Cua street is situated far away from the city center, it is an ideal site for exploring cuisine as well as sight-seeing the District 2. 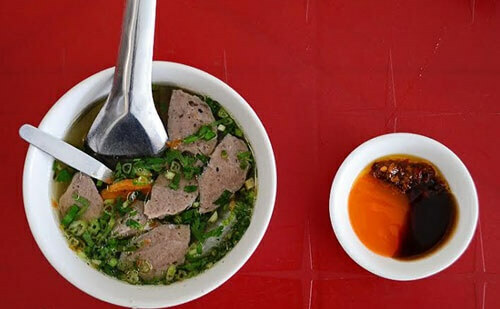 The price is about 15.000VND (0.68 USD) for a cup of beef-ball soup. Crab soup is a famous dish that never brings the feeling of boring. In Saigan on the rainy days, especially in the cool weather, a hot and fragrant cup of crab soup will be a perfect choice. 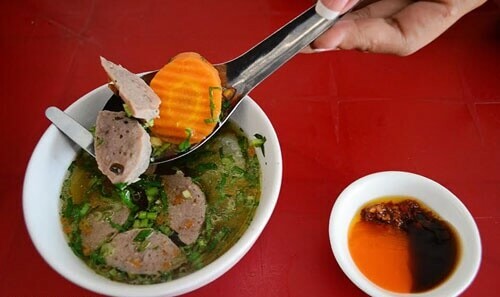 In Saigon, visitors can easily enjoy this tasty dish at anywhere. You can buy and eat at on-site there or take away. 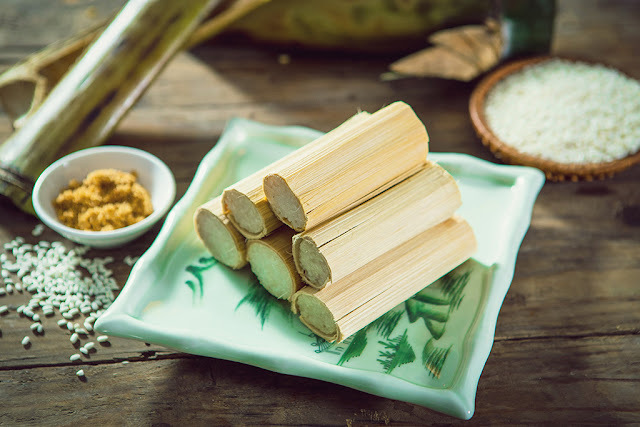 However, it is said that this dish should be enjoyed right at stalls roadside, next to the bustle of the city, which will bring the most interesting experiences. The ingredients to make a condensed crab soup are not too sophisticated: flour blended with crab meat, chicken and materials including mushrooms, scallions, cilantro, and pepper. All of them contribute to make the dish more delicious, featuring with sweet-tasting.